While waiting for the Snapdragon 820 chipset to arrive to be used for the Xiaomi Mi 5, the manufacturer's current flagship isn't getting any younger. The Xiaomi Mi 4 was released over 15 months ago, and the company has tried to keep consumers' interest by releasing the Xiaomi Mi 4i and the Xiaomi Mi 4c. Now, in another bid to placate its fans, Xiaomi has cut 17% off of the price of the Mi 4. 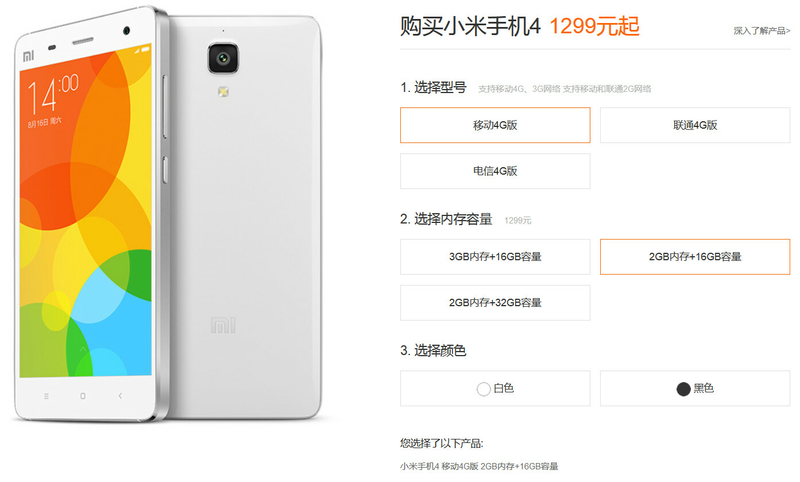 Following the discount, the Xiaomi Mi 4 is now priced at the equivalent of $200 USD, down from $240 before the price cut. The phone can be ordered directly from Xiaomi, by clicking on the sourcelink. The version of the Xiaomi Mi 4 offered at this price features a 5-inch LCD screen carrying a 1080 x 1920 resolution. This works out to a pixel density of 441ppi. The Snapdragon 801 chipset, which was Qualcomm's top-of-the-line SoC at the time, is under the hood with a quad-core 2.5GHz and the Adreno 330 GPU. 2GB of RAM is inside, along with 16GB of internal storage. The 13MP camera on back features an aperture of f/1.8, great for taking photos in low-light conditions. And there is a front-facing 8MP snapper for taking selfies. A 3080mAh battery is on board, and Android 4.4.3 is pre-installed. Other variations of the phone are available, including one with 3GB RAM/16GB native storage ($285 USD), and another equipped with 2GB RAM/32GB native storage ($269 USD). If you're waiting for the Xiaomi Mi 5, we could see that model become available late next quarter. Wooow. Possible to get an US variant too? Yeah, PA, would it work on T-Mobile's network? One plus one and X are better than that. You can't. One of my phones is the N4 and once you use all your space...all you can really do is sit there and cry. Still a better deal than Apple.